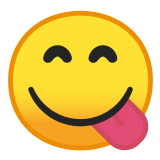 😋 Face Savoring Food Emoji is a smiley that can show that you are looking for something cool, such as a shopping trip or a visit to your favorite restaurant. Nevertheless, this still applies more specifically to delicious treats, such as fruit dessert, ice cream, or a birthday cake. It's similar to the fact that you presented something so delicious that you stuck out your tongue and tightly closed your eyes. 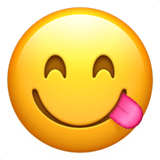 Face Savoring Food Emoji was approved as part of Unicode 6.0 standard in 2010 with a U+1F60B codepoint, and currently is listed in 😀 Smileys & Emotion category. Use symbol 😋 to copy and paste Face Savoring Food Emoji or &#128523; code for HTML. This emoji is mature enough and should work on all devices. You can get similar and related emoji at the bottom of this page.